Will your class escape in time? Oh no! Your class has been captured by a group of swashbuckling pirates! They must use their math skills to escape. Students will attempt to escape from their captors by solving a string of math clues hidden around the classroom. Will your class escape in time? Oh no! Your class has been captured by a group of swashbuckling pirates! Students must use their math skills to escape. Students will attempt to escape from their captors by solving a string of math clues hidden around the classroom. This is a review game for the math concepts taught in 3rd grade. It can be played in small groups, or as a whole class. If your class has never played an escape game before, I suggest playing as a whole class for the first time. This is an interactive game where students are timed. Students try and solve clues and math problems to breakout and escape the classroom. You, the teacher, can decide how much time your students have to complete the task. I will suggest 45 minutes, but it is up to your discretion. You can project a timer for your class, or put one somewhere for all the students to see, so they can keep track of how much time they have left to complete their task. There are step by step instructions on how to set up the game, including pictures! This is sure to capture the attention of your students. Take the time to put it together, it’s worth it! My students LOVED this. Thank you! My students had the best time doing this! Love! My students always get so excited for crack the code escape rooms! My students had a blast with this. Loved this!!! Kids had so much fun with it! SO MUCH FUN. It took a little work to set up but it was so perfect! My students had a blast with this activity! Loved this! Such a fun way for my kiddos to review everything we learned this year! Best test review I’ve done in a long time!!! Such a helpful resource! Thank you! We had so much fun doing this as a class. A great deal of variety in this pack. This is such a wonderful resource for my third graders! This was a great activity! I divided my class (16 kiddos) into 2 groups. They absolutely loved it! I own several of your escape rooms and they are the best! Thank you so much for taking the time to make and share these with everyone. My students loved this activity but it was more difficult than I expected especially with set up. My kids really enjoyed this! Easy to put together and the students loved it! Win-Win!!! Kids enjoyed it… we completed it together and it took just under an hour. My students LOVED this! Thanks! Great fun way to get ready for end of year testing. My students had SO much fun doing this!!! Amazing product! My students absolutely loved it and so did I! It took quite a bit of time to prep, but the directions were so easy to follow and it was completely worth it! Thank you for a terrific end of the year activity! My students really enjoyed this activity. They worked hard at working together! It takes a little time to prep, but once it’s done it’s done. Awesome product. Great resource! Will use again. I loved this, my students had so much fun with this escape room! This was really fun! My students loved it. I love all of your escape rooms! Great activity. The children really loved playing. Can be played in different ways (whole group or small group). Some cards were a little confusing. Make sure to read all the instructions. I can’t wait to try this resource! It looks great. Awesome resource, we used it for MCAs prep. Great product! Fun activity for my students to review/practice what they learned! My students really enjoyed this activity! Great resource! Took some time to organize, but this kids loved it! 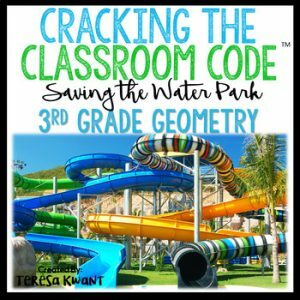 This was a great way to review in a fun way that the kids loved! This was a great way to get the students moving and learning. My class loved this activity as a fun PARCC review! Can’t wait to use this, this school year! AMAZING review. My kids loved it! Thank you! I have just finished putting this together and am so excited to use with my summer school students as a last day activity. I know they will LOVE it! My kids loved this! It was so nice that everything was so clear and easy to put together. Thanks for the product! Lots of prep BUT one it’s done it’s done and can be saved from year to year. I have used it two years now and it’s been so much fun! The students really love it and worked so well together. Thank you! I have bought multiple of cracking the classroom code and my students love it. Its always a fun way to switch things up! This was a fun review activity. I had as much fun as the students! One answer was incorrect on the answer sheet, but it didn’t change the outcome of the game. Another great product! My students love these and it was a great end of the year review. My students loved it. I will definitely be doing more. Very engaging! This got my kids hooked on Escape Rooms! They really loved it. Super excited to try this in the classroom and see how students respond to it! My students loved this! It was easy to put together and it was very engaging for my students. We did this as an end of the year activity. Did not get a chance to use this yet but looking forward to trying it, thank you! What a fun way to review before standardized testing. They loved it! Fun resource! The kids love puzzles and they really enjoyed this activity! This was such a great way to keep my students engaged on the 2nd to last day of school! So fun!! The kids loved this! I purchased the second and third grade sets and they were both amazing! This was a really fun way to review at the end of the year. My kids loved it! My class was super excited to participate in this activity. My class loved this! Great end of year math review. This is a great hands-on way for students to review math skills and get excited about learning. Fantastic! This was challenging and fun for my scholars. When they had a purpose for figuring out the problems, they persevered through it. Fun way to review! Thanks! Used as test prep. Students enjoy the game. I ended up not using this activity this year because my students were too low, but I can’t wait until I get a group that could do it. It looks like so much fun!!! I love this for a review before state testing! Great resource. Students loved it! I used this with a third grade student who I was tutoring. She loved it and so did I! ready to go and engaging! Thank you! Your product was very helpful, thank you! Great review and the kids loved it! This was a really fun activity – my kids loved it. We do the A to Z countdown for the last days of school. 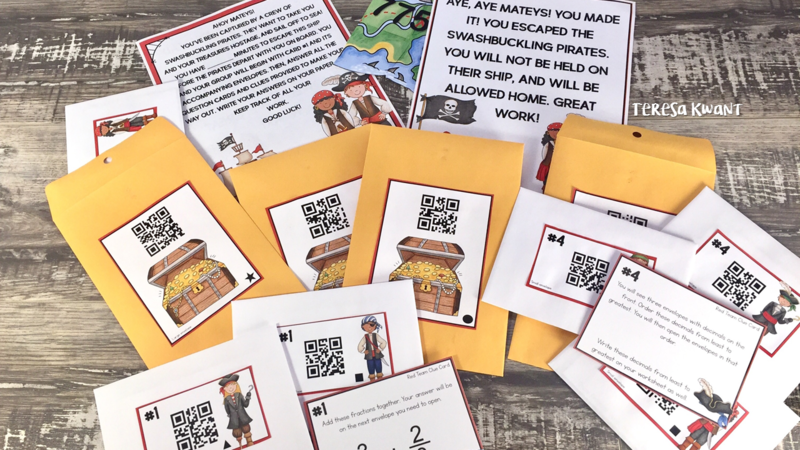 “P” day was Pirate day… this was a perfect end of year review of Math skills as well. I planning to purchase more! Great resource! I played some pirate music along with it and my students loved this! So engaging! Fun review! The students loved it. Thank you! Directions for putting together the clues were confusing at first, but once I got it figured out, it was easy. My students had a blast! Great resource for reviewing – thank you! I haven’t tried this but I will be doing it next week. Looks like a great way to end the year. Despite the amount of time it took to prep everything needed for this, it was definitely worth it! My class had so much fun & it really made them have to think as a team!!! My students LOVED this activity! A really fun way to review! This product is fabulous just like all the others. Thanks for another great resource to make math FUN! So fun!! My students loved this. I wasn’t aware that I needed SEVERAL envelopes, so we did it whole group. It does take come prep time, but my class really enjoyed it! Super fun resource! Thank you! I used this for a year-end review and the kids just loved it! They were engaged from beginning to end and worked collaboratively and productively. My principal observed the lesson and loved it as well! Thank you for such a great resource! My kids loved this as year end review. I played pirate music and dressed up. It was very fun, thank you! Thank you so much! My students loved it! I just finished preparing this challenge for my students to do on Friday. I’m very excited to see them work together and think through this! Thank you! Your escape rooms are the best! My kids love them and I love how engaged they are! 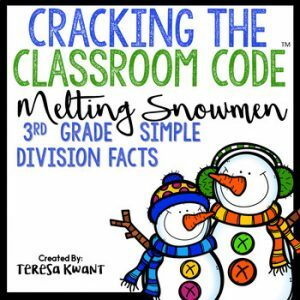 This is a great resource that allows a fun way to review at the end of the year. Well thought out and easy to put together. My students loved this activity! Everyone was engaged and had so much fun! Absolutely love this activity! 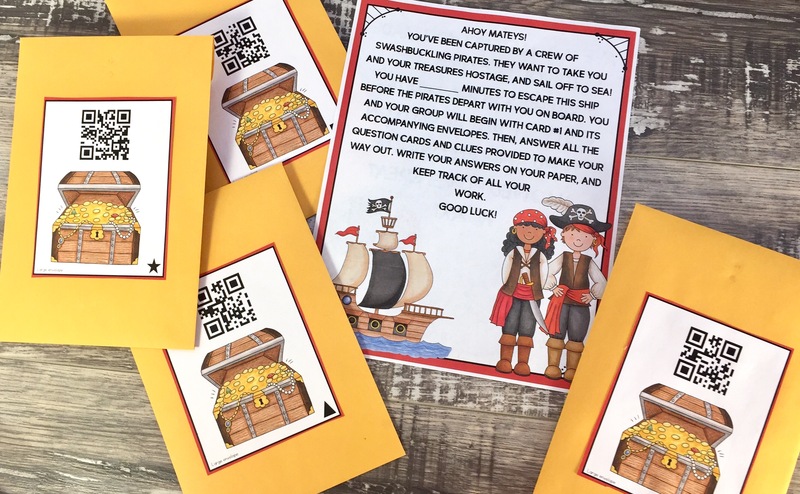 I have a pirate-themed classroom and my students worked together in their “ship crews.” They had a blast reviewing! This was so much fun! My students loved doing it. We did it the last day of school. My students loved this activity. They have asked for more. Thanks for the instructions on how to put it together. It was a fun way to review math and the class learned to work as a team more. This was the best activity! Used as review before MAP Assessments! KIDS loved it and were so engaged! Just bought the End of Year one as well! Thank you! What a wonderful resource to review the math standards for the year! 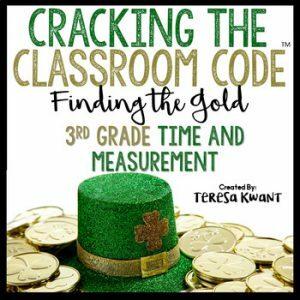 My students love participating in cracking the classroom code. MY CLASS LOVED THIS!!! Pretty easy prep, and they were so excited! Excited to try this out with my students! Looks like a lot of fun! Love all the escape rooms! I used this to review before testing and OH MY STARS! My kids were SO engaged and had SO much fun! Thank you! Super fun way to review our math concepts! The students loved it!!! Great scavenger hunt! Not to be used with a locked box. I can’t wait to use this for the last week of school! Amazing product! My kids were engaged and working hard to solve all of the problems! Great purchase. This was a very engaging class activity, however the prep time it took me to prepare for it was A LOT!! I wanted to make all the sets so that my kids could do it in groups, but by the time I printed, laminated, and cut everything I ended up only making three sets which still took me 2+ hours. Fun and engaging end of the year math activity! This was awesome! My kids loved it. I did 5 separate groups. I had to keep reminding them to answer the last question before going to find the envelopes. But excellent resource! Absolutely love this. My kids are OBSESSED! Such a great resource. Takes a while to prepare, but worth it in the end because they can be used over and over again throughout the years. Great resource for review, thanks! So excited to try this- this will be our first time ever!!! The kids really enjoy this! Fun way for test review! Thanks. I was wanting to do something like this with my class. Now I won’t have to create all of it. It is nice to have this because I’m short on time. A little prep work, but fun! My students loved this- and so did I! My classes loved this escape room! After putting this together, I found that some of the questions (specifically fraction ones) were a bit to complicated. I couldn’t figure out a way to help guide my students for some of the questions. Good product, maybe for 4th grade? My kids loved this activity to review for the FSA! My students really enjoyed this activity. Thank you! This looks so awesome! I can’t wait to do it with the kiddos! This was a huge hit with my 3rd grade gifted kids. Great review and tons of fun! Wow! You sure put a lot of thought into planning this type of activity! I am excited to use it for our state testing review. I am positive the kiddos will Love it. I am also, I bought the fraction one and plan on purchasing more! Thank you for sharing your creativity! I love this! This will help my kids be more excited for our state tests coming up! They love solving riddles. I love how they have to answer each question in order to be able to solve it correctly. The kids can’t take the easy way out! I just wanted to double check my math, though, for one question. For question number 9, would the answer be 6:31?? Great product! The kids enjoy the interactive activities! Love getting them moving. Great resource! My students loved it! I bought the beginning of the year classroom code and thought it was great. My students were a disaster with it though (they couldn’t follow directions) Trying again for testing prep- hope 7 months will make this go smoother. It looks daunting but instructions are very clear and it’s easy to set up. I am really looking forward to using this in a few weeks when we start to review for our state test. I am so excited for my class to do this review. I think they will have a great time doing this. Thanks! I know that my students will be more engaged while we are reviewing for upcoming state testing, with this product. I have bought both the 5th grade and the 3rd grade versions of these! They are amazing resources for prepping for Smarter Balanced Test! I just realized I bought this, then bought the bundle also! Thanks for all of these great resources! Students loved this. They were very eager to solve more problems so that they could find more clues. I have never done an activity like this and I am super excited to do it. I will be doing it the friday before our Math state test to do something fun yet making sure we are reviewing our skills. It looks awesome! Now i have to sit down and set everything up. Great end of year activity to do with my students! This was so fun! My students were so motivated! Excited to use this! Definitely plan on buying more for next school year. I cannot wait to try this! I have legitimately bought all of your Cracking the Codes this week and I am SO excited to go in on my day off tomorrow to get them all printed and prepared! 🙂 Thank you for awesome products! My students had so much fun! My first Escape Room purchase! Looking forward to trying it next week! I even bought gold coins at the Dollar Store to make it more exciting. This was awesome! Great way to review and to practice collaboration. I look forward to purchasing more of this style of this seller. The engagement level was incredible with this activity! My students enjoyed doing this activity! We did it as a whole class. When we do this again, I will have the students separated into four groups. Overall, super fun, and the students learned a lot! Our class really enjoys these! Keep them coming! My students loved this product. They were having fun and learning at the same time. It does take a little prep work, but well worth it. Great resource! My students went crazy doing this. What a fun idea! Really kept my students engaged. Loved this for my third graders! My students loved this! I bought all of them! Love this! Great way to review and fun! This is the second one I have purchased. My students love this activity a lot. 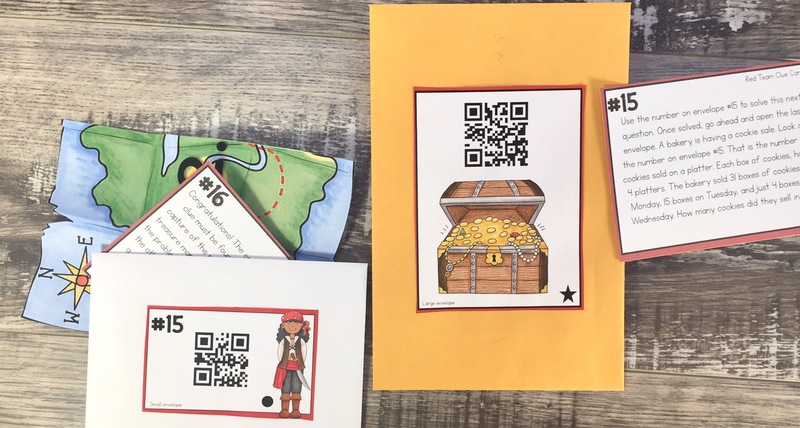 This has made an excellent addition to my math center and students love to use technology so the using the Ipad to access the QR codes was a hit! This was such a fun activity for my kiddos. Thanks for creating a great product. It did provide a challenge to my third-graders. Super fun. The class really enjoyed it! Thanks for the great resource! I’m excited to give it a shot in my classroom! My kiddos loved playing this as part of an end-of-the year review! My group had a blast with this. So much fun! Awesome, My students loved it!! We loved using this for a week-long summer camp! Fun way to review before standardized tests! Love this! Can’t wait to play it with my students. Thank you! My kids thought this was amazing!! They didn’t even realize they were reviewing their math skills. This was by far their favorite activity we did all year! Thank you for such a fun, creative and engaging resource! Used with my 4th graders at the beginning of the school year- Great mixed review and allowed me to see who may need more reteaching with concepts! Thanks for the engaging review! This is a fantastic and fun resource! My kiddos loved doing this at the end of the year! These are so much fun I have been collecting them all! I can’t wait to try this, I think the kids will love it! Love this! Kids did too! The kids ate this up! This product was so clear and easy to put together. My students were so excited when they came in and found out we were going on a treasure hunt! A fun way to review! A great way to review the year before. The product itself is great, but it is a little advanced. Our CSOs for our state do not require adding and comparing fractions until 4th, and do not require adding fractions with unlike denominators until 5th. It is a good product, but I cannot use it to review 3rd grade concepts with my 4th graders. My kids really enjoyed this but even at the end of the year in 3rd grade really needed a lot of support and doing it together once. This will serve as a great review for my 4th graders at the beginning of the year! What a fun activity! Incorporating learning and engagement at the same time. Thanks! Did this at the end of the year after EOG and my students LOVED it! It is a great review and also awesome for teamwork! Second one I have purchased. Love them! Didn’t get to use this last year but still looking forward to using this product. Appreciate the time you took to make this! These are great! Can’t wait to use them with my class! This was so fun of army students to do at the end of the school year! Thanks! The kids had great fun! This was such an engaging way to review skills! My students loved it! Third graders had so much fun with this review, it was awesome! This is going to be so fun to use! This was such a fun way for my students to review for state testing!! It encouraged them to work together and they LOVED every second of finding the clues!! My students loved this activity! It was very engaging and a great review! Was a great (and fun) activity to complete as a review before testing! This is incredible! I cannot wait to use it. Thank you!!! Cannot wait to use this, the kids are going to love it! It was a fun review activity, although it was too difficult for my low 4th grade class. The instructions to set it up were great, but it took me 4+ hours to print, laminate, cut, and sort out the envelopes. Such a great resource, my 3rd graders loved it! This was wonderful! Thank you so much!!!! Fun and engaging way to review! Although it takes some prep to put together ( I did not use the QR code version as I do not have access to enough phones/tablets to use them). It was SOOOO worth the time and effort! My kids absolutely loved it. It took them about 50-55 minutes to solve. This will be so fun as a beginning of the year review for my 4th graders! It definitely took me a few days of trial and error to figure out how to best implement this with my class…but once we got the hang of it, boy did they love it! It was an excellent eye opener to see what needed to be reviewed, but they were so focused on cracking those clues! My students were so excited about this game. I really liked that I didn’t have to go out and purchase expensive locks and boxes for this game. Very easy to assemble and the students loved it. Can’t wait to try this with my students this year! The game took some time to put together and organize (which I knew in advance :). The class loved playing the game! It was challenging enough to keep them engaged, but not frustrated! Thanks! Great product! The students love it! This was a fun activity to end the year. Once my students got past the arguing/debating with their teammates on how to solve the problems, they absolutely LOVED it. We didn’t finish it in one day in the allotted time I gave them. The next day they came into the room asking if they could finish! I so enjoyed their little minds working and collaborating. I love your product! Thank you! My students really enjoyed doing this the last week of school, definitely would do again! My students LOVED this activity. They were working together, excitedly searching for clues, and they were all so happy when they were finally successful at the end. No groups needed longer than 40 minutes to complete all the tasks. I am planning to use this as a back to school review! Looks like a fun review activity, though there is a lot of prep to create them! Hopefully, I can find time this summer to set it up for next year! Excited to try this next year! Love this!!! My 3rd graders worked this on the last Friday of the year and loved it! I put on pirate music and even talked like a pirate during the exercise. I would stress to the kids that they need to show their work between each envelope. I have a feeling a few just looked off of their classmates. My kids absolutely loved this activity! I absolutely love this idea. I bought it for next year. I wish I had seen it sooner. This is fantastic! I loved how it made my students think. 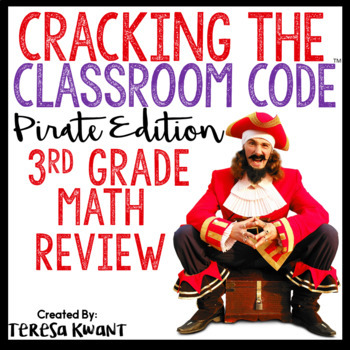 For the next school year I am going to purchase the other Cracking the Classroom Code activities and start doing them at the beginning of the year. Thank you! I am keeping my eye out for reading and grammar ones. I think they are so much fun! SUPER engaging way to do math at the end of the year. For third grade, definitely do one together first or they’re a bit lost! This is a lot of fun and really engages kids. Thank you! My students absolutely LOVED this activity! Thank you so much! It was a great and fun way to review before my students took the math portion of MCAS (Massachusetts Standardized Testing) in May. I will definitely be using it again in the future! Love these, and can’t wait to use them next year! Thank you for making this wonderful resource. My students were fully engaged. Very engaging; my kids loved it! My class LOVED this and is begging for more! Great way to keep them engaged at the end of the year. Super fun! My students loved doing this activity on the last day of school! I can’t wait to set this up! Awesome! It was a little difficult to understand, but after I put the first set together it was great. One of the time answers on the answer sheet was incorrect, but it didn’t effect the game. I think number 9 should be 6:31. If it is 5:55 and 36 minutes pass, it should be 6:31, not 6:18. Overall fun. Neat idea. Took a little time to set up, but I figured it out. Can’t wait to use it. It will add some excitement to test review. Although this looks a little tricky to set up, I know it will be a huge hit when I use it! The directions were a little hard to understand, but once I figured that out it was so easy to put together and a great resource for when review gets boring! thanks! This is so awesome! Great review at a time when my kids are done with school! Just finished setting this up to use tomorrow! I’m super excited to see how it plays out! Such an exciting way to review. I even dressed up as a pirate when we did this activity. My kids LOVED it. It got them to really work together! Once it’s set up, it’s lots of fun. Took awhile to get it organized for multiple groups. Using this as part of our end of the year party! My kids can’t wait! Such a great way to review the math concepts for the year! Can’t wait to do this in my class! Great directions and everything was awesome! Great resource for fun end of year activity! Thanks! For me, this set was a challenge to set up. Pictures are very helpful. Kids LOVED it. WE LOVED THIS!!! Thank you so much for creating this! Great activity! My students really loved this! My students loved this review and figuring out the clues. We did this whole class. They had a blast! Thank you. Easy to set up and use. The pictures are very helpful during the set up. My third graders LOVED this activity, and I loved how simple it was to prep!! Great activity for my students, they love it!!! This is such a great resource! Thank you so much!!! This was a wonderful resource to use as review before state testing! The students had a blast. I was a little nervous about the setup, but the instructions were very thorough. I would definitely recommend this purchase! This is perfect. Cannot wait to use this to end the year. Thank you! I cannot wait to use this! I am so excited to use this with my class. They will love it! great end of the year activity! kids love it. instructions easy to follow and nicely organized! My kids loved this. It was a lot of fun! Very engaging review for students!!! My students loved this review game! Hid all the clues around the school. My students loved it! Can’t wait to use it!! Thank you!